Provide subitizing practice for your little learners with this activity that gets your kiddos up and about while practicing their ability to instantly recognize numbers represented through ten frames, tally marks, and dice. Instructions: Copy and laminate the cards for extra durability. Hang the cards around the room and have the kids search, recognize, and write their answers on the provided recording sheets. 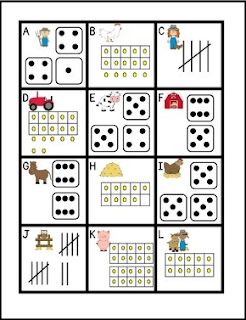 You can also place the cards in a basket and have students complete the activity as an independent math center. **Please take a moment to rate this FREEBIE. Your comments are greatly appreciated!